Kick off this Costa Rican adventure with a hearty breakfast, fuelling up for an exploration of the Poas Volcano National Park. In the park you’ll discover untouched nature, an active volcano, and have the chance to breathe fresh, cool mountain air. At the top of this volcano, 2,700 metres above sea level, you can step to the edge of a platform and look down on a smoking sleeping giant – steam can pour out around a sulphuric, bubbling, green crater lake. You can also take a gentle hike to the other side of dense green cloud forest, along a meandering trail to a second, inactive crater. The crystal blue Botos Lagoon is surrounded by bird-filled trees, and if you’ve got extra sharp eyesight you might catch sight of a hummingbird. Later, back at the bottom, take a city tour of San Jose; you may pass areas like the Plaza de la Culture and the Mercado Central, which are great places to get a real sense of daily Costa Rican life. You’ll also make a stop at the Pre-Colombian Gold Museum to explore its glittering collection. Gold had an important function in the indigenous social hierarchy, and it was of course a big reason why the Spanish were attracted to the area. in the afternoon we make our way to La Tigra Rainforest where we spend the night amongst the rainforest. The conservation area directly supports the local School, supports join opportunities for the community and assist with re-foresting projects. Our accommodation for the night is in permanent tent cabins on raised platforms. Each tent has a balconies overlooking the rainforest. The rooms are made fof reforested wood taken from the property. All tents have provide bathroom facilities. After breakfast, it's time to head out to Arenal Volcano National Park. The scenery is made up of primary cloud forest and rainforest, and it's a land of rivers, lakes and, thanks to the volcano’s inner workings, a number of thermal springs where hot, lava-heated water gushes to the surface. Some of these springs have been turned into thermal pools, often surrounded by dense foliage, making them a great place to relax and chill out. Your accommodation for the next two nights has a particularly special feature – a pool with a view of a towering volcano! There is time to relax and have a splash here on arrival, before visiting the volcanic thermal pools at the Ecotermales Hot Springs, where you can enjoy a soak before dinner. Get and explore the lush tropical surrounds of this idyllic location with the family. For many, one of the highlights of this trip is the exhilarating fun of battling the gushing rapids of the Balsa River. The level of rafting here is very suitable for families (Class 2 to 3), but please note that the minimum age is 8 years old. After a safety briefing and getting kitted out with an orange vest, you’ll get wet and wild, working your way as a team through increasingly challenging rapids with names like ‘Magnetic Rock’, ‘Congo Loco’ and ‘Dredges’. Along the way, look out for wildlife such as sloths and Toucans – if you’re not too busy getting wet that is. When you finish and return to the hotel, there may be time for additional activities like hiking. If you’re worn out from the day’s action, then not much can beat chilling by the pool and gazing up at the much-loved famous volcano. It isn’t spewing lava every day and night like it used to, but it is still rumbling and puffing out plumes of gas. Travel along the Arenal Lake – a famous hangout for windsurfers – via Tilaran to Monteverde de Santa Elena (approximately 4–5 hours). 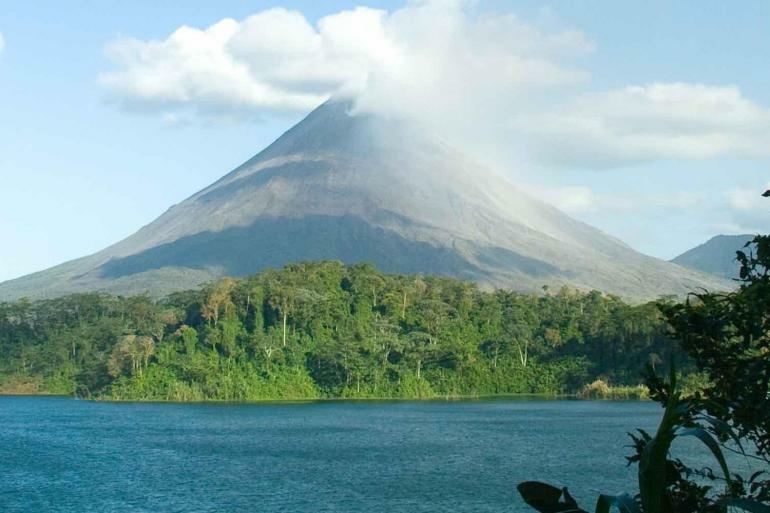 Enjoy superb views across the lake back towards the Arenal Volcano, and stop on the roadside for some homemade cakes and refreshments. Climb to Monteverde, feel the climate cooling and see the vegetation change from tropical to cloud forest. The surrounding hills are scattered with fair-trade co-operative coffee plantations, famous for producing some of the best coffee beans in the country. Teeming with wildlife, the Monteverde Cloudforest Biological Preserve is a nature lover's paradise. Cloud forests are similar to rainforests, but instead of relying on rain for essential moisture, the water comes from the semi-permanent cloud that covers the region. More than 2,000 species of plants, 320 bird species and 100 different types of mammals call Montverde home. You’ll have lots of time to discover the natural wonders here. In the afternoon there may be time to visit a butterfly farm (optional). Departing Monteverde, descend to the Pan-American Highway, which you’ll follow southward across the flat coastal plain. Your journey takes you along a coastline of fine sand beaches, separated by the occasional area of mangrove and endless plantations of African palm. Your journey ends at Garabito. (approximately 6 hours plus stops). Your accommodation is on the Pacific Ocean and the tropical forest, and part of the property has been officially declared a Wildlife Reserve thanks to its biodiversity in plant species and fauna, such as spider monkeys, sloths, coati, and armadillos. Soak up some rays and relish the spoils of this unique beach setting, where lush rainforests sprawl gently towards the sand and white-faced capuchin monkeys peer cheekily from the treetops. It's a 300meter walk to the beach. 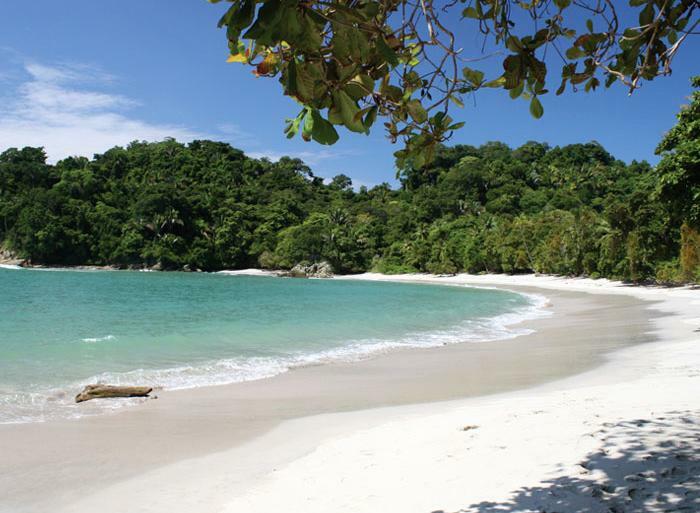 Manuel Antonio National Park stands a few kilometres south of Quepos on the shores of the Pacific. Incorporating 12 small islands scattered just off a coast where migrating whales can sometimes be seen, the park is home to hundreds of mammal and bird species in a region of lagoons and fertile mangrove swamps. During your time in the region, you’ll enjoy a three-hour guided walk along the trails within the park and have plenty of time to relax on one of the idyllic palm-lined bays. The turquoise seas are perfect for swimming, kayaking, sailing or fishing. It would be easy to spend your whole time here in, or by, the water, where lush rainforests sprawl gently towards the sand and white-faced capuchin monkeys peer cheekily from the treetops. This is a great spot for a family holiday, with fully equipped apartments, swimming pools, water sports and many activities for both children and adults. After breakfast, leave the accommodation and retrace your steps northward along the coastal road to San Jose (approximately 2–4 hours). The adventure comes to an end on arrival at Juan Santamaria International Airport (SJO) and there is no accommodation included for tonight. If you’re flying out today, it's important to book your flight for no earlier than midday. If you wish to stay longer we’ll be happy to book additional accommodation for you (subject to availability) and provide a complimentary transfer back to the hotel. Please enquire about these services at the time of booking the trip.